So it’s a good thing we’re making progress in the baby’s room! 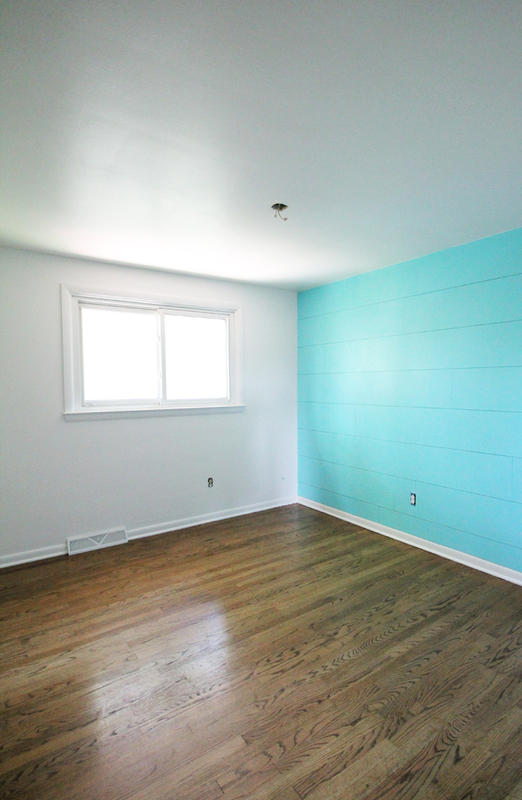 The whole room is now officially painted, floor to ceiling, plank to wall, and it’s awesome. 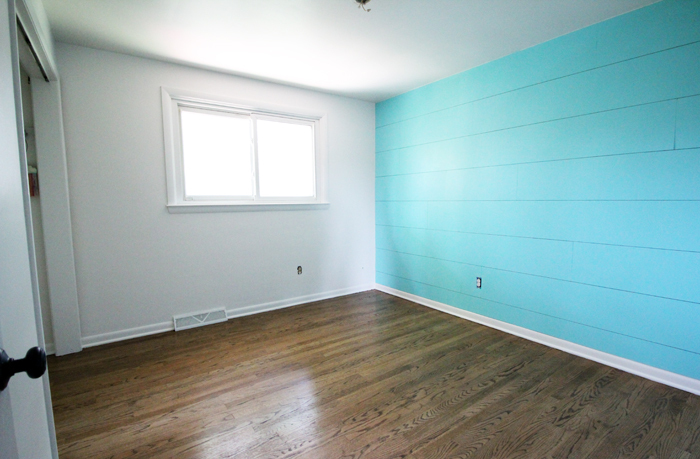 We just love the color of the planked wall — Valspar’s “Sea Wave” (5009-9C). It’s bright and cheerful but also light enough to be calming. Leaving the other three walls white (Sherwin Williams “Snowbound”) helps to keep the blue from becoming overwhelming, and there will be a large, fluffy white rug in here as well. We ordered a dresser! Last week we asked you guys to help us pick a dresser for the nursery because we just could NOT decide. After pouring over your votes and doing a lot of discussion on our end, we ultimately decided to go with option #3, which is a white-and-wood dresser from Buy Buy Baby/Bed, Bath and Beyond. We liked that the style was similar to our dream dresser from West Elm (#5) but several hundred dollars less, and unlike our second favorite, #1, it will fit a changing pad and is higher quality (made of wood instead of particle board). Plus, I figured out that I could order it through Bed, Bath and Beyond, using a 20% off coupon that luckily came in the mail yesterday and saved me $110, AND shipping was way less than through their sister-company Buy Buy Baby (which is weird, right?). So it ended up being a reasonable price and I love that it will arrive fully assembled. Now that those big projects are done and decisions made, the real fun starts. The crib should arrive soon, as well as that dresser, and we already have the other major furniture pieces. Then it’s just deciding on a layout and decorating, which is the best part of all. That’s good because rumor has it this baby is on his way!